All of Mina’s clothes were turning red, her mother continued frantically, buying her a blue hoodie that would hopefully fix the situation, but it was no use. When Mina opened her closet, there her once blue hoodie was, in pure crimson red. Mina is an awkward and uncoordinated teen living in a life where she is surrounded by fashionable, social, and popular people. That is until she saves the most popular guy in school, Brody Carmichael from falling to over the cold, metal, railing of an old bakery to his death. After this she sees her heroic story everywhere she goes. Not just this she becomes much more popular. Suddenly, everyone knows who Mina Grime is. Although this is something Mina has always wanted, she soon realizes that all the attention she is getting will only cause her to be found by something that has been following her, her whole life. Something out of this world, mysterious and dangerous, that she in completely unaware of. This was a very thrilling book! It kept me on my toes the whole time. 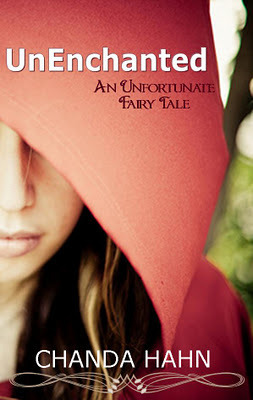 Chanda Hahn created a book that combined the typical story of an un-social, average girl and the unimaginable, mysteriousness, and un-real actions of a fairytale all in one intriguing book. Her writing style created an intense level of suspense and creativity. Then she ended the book with a unbelievable shock that left you craving more of this twisted fairytale.